ManageEngine has added Office 365 bulk licence support to ADManager Plus, and Exchange Online reporting to ExchangeReporter Plus. IT management software provider ManageEngine has enhanced its Active Directory management program ADManager Plus by adding an Office 365 bulk licence manager. The company points out that the Office 365 management portal cannot manage more than 20 user licenses at a time, nor import users from a CSV file and bulk-edit their licenses. As if that wasn't enough, provide the capabilities necessary for optimising Office 365 resource management in a Windows Azure Active Directory environment. Instead, it leaves administrators to use PowerShell for such tasks. So the new Office 365 bulk license manager in ADManager Plus simplifies Office 365 administration by allowing multiple licences to be modified at one time, including the ability to import a user list from a CSV file. It also makes it easy to enable or disable services according to user requirements, and allows the delegation Office 365 license management and reporting to help desk technicians within their area of responsibility. ExchangeReporter Plus's new Office 365 reporting module provides information that is not available from the Office 365 management portal without resorting to PowerShell scripting. These include reports on inactive mailboxes or the top 10 mailboxes by size. Other reports include a list of all Office 365 users who have been assigned Exchange online licenses and mailboxes, the size of individual mailboxes and the number of messages stored in them, and inactive mailboxes. “After we added Office 365 provisioning and reporting capabilities to ADManager Plus, our customers started asking for a bulk license management utility that would offer some flexibility in managing Office 365 licenses,” said ManageEngine http://www.manageengine.com/ director of product management Manikandan Thangaraj. ADManager Plus prices start at US$495, and ExchangeReporter Plus starts at US$295. Fully functional, 30-day free trial versions of both products are available. Advanced Automation Management: A powerful automation management system allows users to quickly and easily setup, edit, and organize automation rules and Event Chains to maintain an efficient and effective network infrastructure, saving organizations time and money. Customized Chain Logic: Step-by-step logic blocks provide users with simple, intuitive Event Chain creation. Easy to use If-Then-Else logic statements allow users to customize Event Chains to meet their exact specifications. Quickly develop complex Event Chains to simplify existing automation scripts and allow both technical and non-technical users to manage the network. Limitless Adaptability: Reactor allows users to create automated Event Chains for nearly anything. Write new conditions, actions, and triggers to integrate with in-house and third-party applications to fully adapt Reactor to your environment. With dozens of pre-configured triggers, conditions, and actions, Reactor provides users with plenty of out-of-the-box capabilities that cover nearly any implementation. Comprehensive Reporting: Nagios Reactor provides system administrators and users with the information necessary to determine the effectiveness of their network automation processes and prevent prolonged recurring errors. 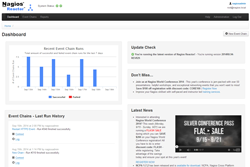 Reactor's reports provide the detailed results of Event Chains run, failed, and Event Chain statistics. Advanced User Management: Reactor comes equipped with user management capabilities identical to other commercial Nagios IT Management solutions. Reactor increases tech team efficiency by allowing the work to be spread over multiple teams and users. Admins also have full control of user permissions and settings with a multi-tier user hierarchy that ensures a secure Reactor system. Organized Workflow: Nagios Reactor can be leveraged by organizations to simplify and organize existing company workflow. Easily manage complex Event Chains automation with tags and advanced sorting features. Spend liess time sifting through Event Chains and spend more time automating your network. 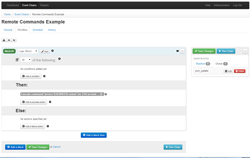 Import / Export Event Chains: Reactor allows users to import and export their Event Chains. This functionality allows for a level of community contribution comparable to Nagios Core. Don't have what you need? Download an Event Chain that someonw else has created on the Nagios Exchange and import it into your environment. Nagios Reactor downloads are hosted on the Nagios Library. Click the link below to visit the downloads page. Nagios Reactor™ is an advanced automation engine designed to save organizations time and money by reacting to problems without human interaction. Reactor allows organizations to rapidly develop, deploy, and manage complex automation tasks in and easy-to-understand manner. Ease of Use: Nagios Reactor's web-based interface allows end users of any skill level to create and manage otherwise complex automation tasks. Reactor's Event Chains are quickly constructed and easily maintained and can be used to simplify existing automation scripts. Increased Efficiency: Comprehensive reporting allows administrators to evaluate system performance and determine the effectiveness of their network automation processes. Ensure automation efficiency by establishing and scheduling recurring Event Chains so individual steps in critical business processes are never overlooked. Time Savings: Save time with Reactor's advanced automation engine. Automate problem resolution procedures across your organization's infrastructure and minimize down-time. Setup Event Chains easily and manage commonly used logic blocks to streamline future workflow. Organize event chains with tags and advanced sorting features to help save valuable time. Adaptability: Reactor allow users to craft automated Event Chains for nearly any situation. Write new triggers, conditions, and actions to integrate Reactor with in-house and third-party applications. Reactor adapts to your environment so you don't have to. Seamless integration with existing Nagios IT Management Solutions to allow organizations to enable automatic resolution of incidents detected by Nagios XI or Nagios Core. Advanced User Management: Nagios Reactor's advanced user management system makes it simple for administrators to create and assign users to teams with specific permissions and settings to fit your organization's needs. Administrators can maintain system security with limited access, read-only, user settings in addition to adding teams of individuals to manage specific automation processes to ensure that only authorized users alter the Reactor system. Comprehensive Reporting: Allows administrators to evaluate performance and determine the effectiveness of their network automation processes. Ensure automation efficiency by establishing and scheduling recurring Event Chains so individual steps in critical business processes are never overlooked.